TAKES ROOT IN DOWNTOWN EDMONTON. Kanu Cafe (pronounced kuh noo’) is a plant-based restaurant located in downtown Edmonton. Our global menu is inspired by the culinary genius of Matthew Kenney - world-renowned chef, author, and ambassador for what many consider the future of food. Appetizers and entrees include a wide range of both raw and cooked plant-based dishes, cold pressed juices and smoothies, as well as a robust selection of wine, signature cocktails, and Canadian craft beer. We think our food is amazing, but it’s nice to see that you do too! Thanks for recognizing us and making us a certifiably amazing place to enjoy plant-based cuisine in Edmonton! For immediate and accurate service, please book your reservation online with OpenTable. Dinner reservations are encouraged. An automatic 18% gratuity will apply to all groups of 6 guests or more. Black Truffle + Charcoal. Aged Cashew Cheddar. Seasonal Pickled & Fresh Fruit. Almond Fennel Cracker. Preserved Lemon. Shaved Raw Vegetables. Capers. Cornichon. Radish. Herb Salsa. Grilled Bread. Grilled Sourdough. House-Made Butter. Olive Oil. Truffle Mayo. Sesame Bun. Radicchio. Fried Chickpeas. Harissa. Za’atar Lavash. Guacamole. Salsa Verde. Lime Crema. Radish. Blue Corn Chips. Lemon Zest. Truffle Salt. Parsley. Truffle Mayo. Sea Beans. Capers. Dulse. Sunflower Caesar Dressing. Pink Oyster Mushroom. Cashew Hoisin. Spicy Greens. Togarashi Cashew. Avocado. Red Pepper. Cucumber. Pistachio. White Balsamic. KELP NOODLE CACIO E PEPE. Snap Peas. Pea Sprouts. Crispy Oil Cured Olives. HEIRLOOM TOMATO + ZUCCHINI LASAGNA. Sun Dried Tomato Marinara. Macadamia Ricotta. Pistachio Pesto. Quinoa. Black Lentil. Butternut Squash. Marinated Kale. Avocado. Piquillo Romesco. Lemon Tahini. Sunflower Cheddar. Pickles. Beetroot Ketchup. Spelt Sesame Bun. Sweet Potato. Cinnamon. Maple. Cane Sugar. Marshmallow Coconut Cream. Chili Pecan Crumble. Fresh Sorrel..
OUR GRAB & GO SELECTION CHANGES DAILY. AVAILABLE UNTIL SUPPLIES LAST. Vodka. Lime. Ginger. Juice. Agave. Vodka. Nori. Vegetable Juice. Traditional Caesar Spices. Vodka. Kombucha. Regional Fruit Blend. Lemon. Agave. Fruit Puree. Bourbon. Malbec. Saskatoon Berry. Lemon. Agave. Triple Sec. VISIT US TO VIEW OUR LATEST SELECTION OF CONTEMPORARY WINES & CANADIAN CRAFT BEER. MAKE ANY SMOOTHIE A BOWL WITH FRESH FRUIT + CHOICE OF RAW BUCKWHEAT GRANOLA OR MUESLI. Avocado. Banana. Mango. Spinach. Kale. Lime. Ginger. Apple. Spirulina. Cacao. Banana. Almond Milk. Dates. Maca. Almond Butter. Cinnamon. Coconut. Mango. Pineapple. Turmeric. Ginger. MCT Oil. Cinnamon. Black Pepper. Tocos. Acai. Banana. Strawberry. Blueberry. Hemp. A pair of entrepreneurs known for their innovations in real estate and the culinary arts, have joined forces to break new ground in the restaurant field. Kanu Café takes the term “healthy restaurant food” from fiction to fact. And that’s precisely what Sherry Schluessel, successful Edmonton real estate developer, philanthropist and wellness lifestyle advocate - envisioned when she approached acclaimed culinary educator and plant-based chef Matthew Kenney with the idea of bringing his award-winning cuisine to Canada. 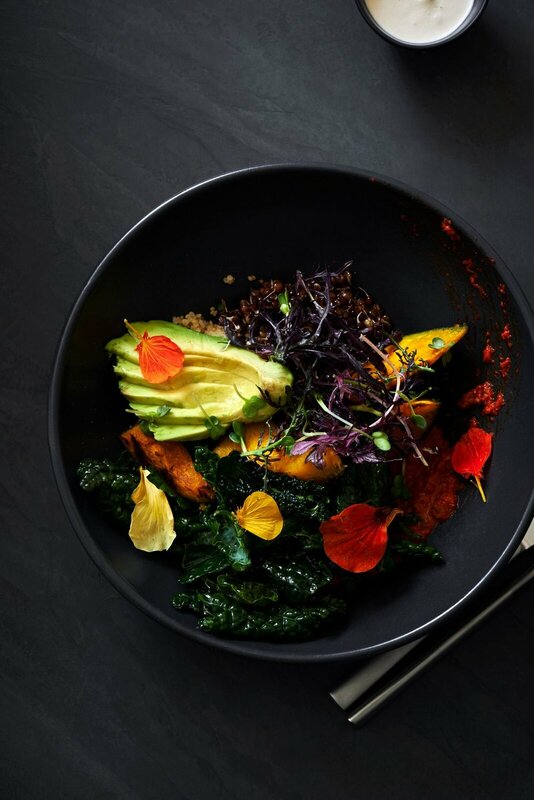 Kanu features an assortment of dishes that are centered on refined and minimally processed plant-based cuisine, cold pressed juices and smoothies, as well as a full wine and cocktail menu. All feature recipes have been crafted by Matthew Kenney, the world renowned chef and culinary educator. A long-time health and wellness devotee, Sherry’s motivation to bring Matthew’s cuisine from California to Canada stemmed from a desire to reconnect to the wholesome foods she enjoyed as a youngster growing up on a farm in Western Canada. More than a year ago she started modifying her personal diet to include more fresh vegetables, fruits, and plant-based foods. Meeting Matthew and discovering his culinary creations elevated her passion for plant-based food to an entirely different level. That philosophy is embodied in Kanu’s brand slogan, PLANT good™. More than a clever tag line describing the appetizing nature of our menu offerings, the statement speaks to our founder’s deeply rooted commitment to improving the lives of others through education and giving back through corporate social responsibility. Together, Sherry and the Kanu Cafe team are at work to introduce Kanu, and other culinary concepts featuring Matthew Kenney’s proprietary methods and recipes, to multiple urban centres across Canada, joining over 15 other plant-based restaurants Kenney has opened worldwide. To educate and inspire the world to share the good that stems from the plant-based foods and experiences we serve. 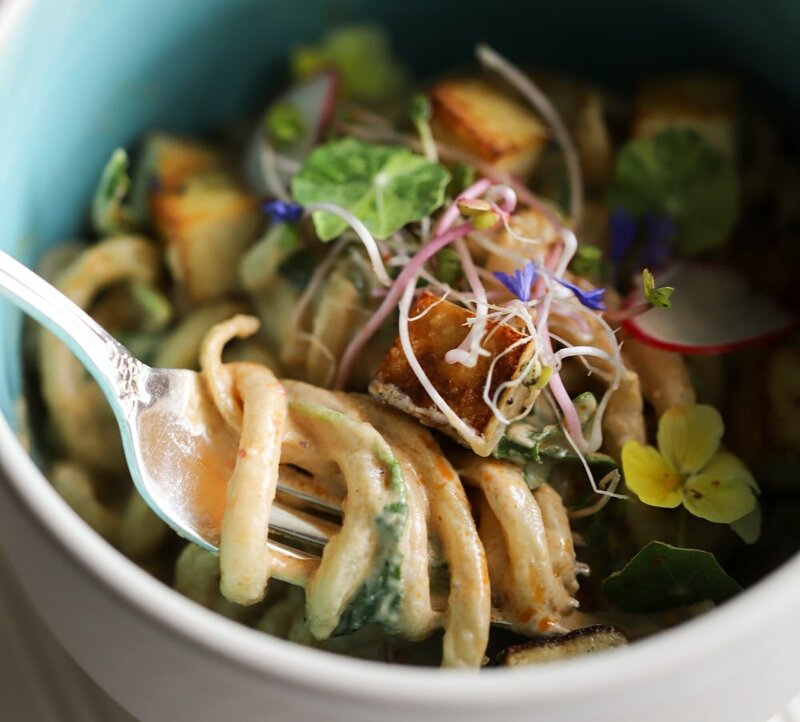 To introduce our plant-based cuisine to a world that savours freshness, embraces goodness, and shares our founder’s passion for health and wellness. We will draw inspiration from her dream of touching as many lives as possible - through our recipes and message - helping others live healthier, more fruitful lives. We will think globally and grow locally. We will help others re-think the relationship between mind, body, and food. We will redefine the meaning of good food. We will be authentic in what we say and what we eat. We will be intentional about our food choices. We will educate those who yearn to learn. We will serve that which comes from the earth. We will advocate, not pontificate. We will inspire through insight. We will be passionate, but patient. We will live well by eating good. Together, we will PLANT good™ and watch those deeds spring to life. ©2018 Kanu Restaurants Ltd. All Rights Reserved.